Previously, I shared my inspiration for the Aydin Center for Plastic Surgery. I’m really pleased with how things have come together. I'll be posting the final reveal soon, but for now, here's an inside look at what we've been working on. 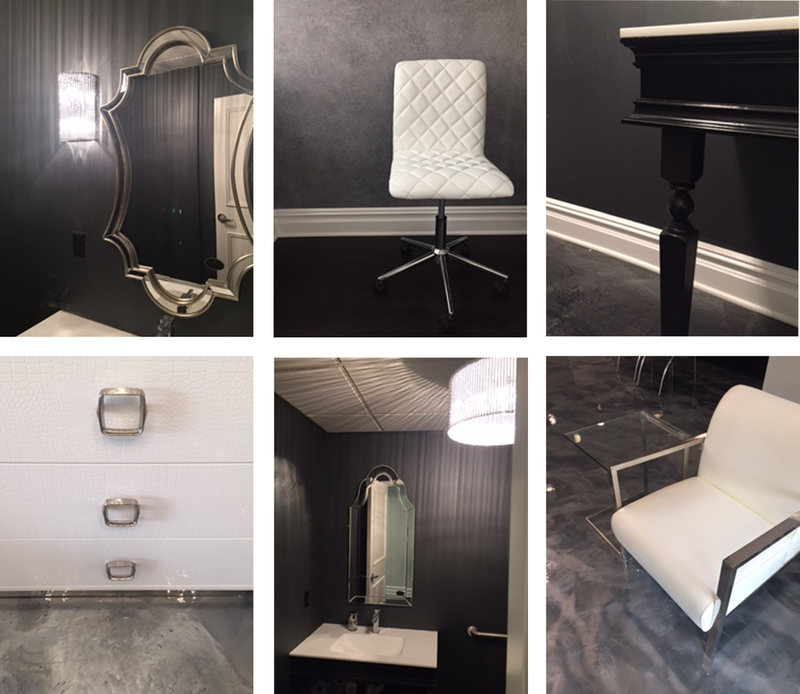 Clockwise from top right: 1) The silver quilted upholstered wall makes the reception desk a much deserved focal point. 2) The back hallway features a textured champagne wallcovering. 3) The waiting room shows a beautiful relationship between the fluidity of the epoxy floors, the sparkle from the light fixture, and the crispness of the white furniture. 4) A custom back-lit sign greets clients upon entry. 5) The high-gloss black reception desk is striking against the glamorous white and silver room. 6) A view of one of the exam rooms, which will feature a streamlined full-length mirror. These images prove that the beauty is in the details!